Having never seen any of the previous Mission Impossible films in full, not that I remember at any rate, the most appreciative fact about Ghost Protocol is that it stands well enough on its own. Back-story references are kept to a minimum and there is no angst and drama relating to any of the first films. There is some tension in that regard sure, but not in a way that it comes across as overbearing. 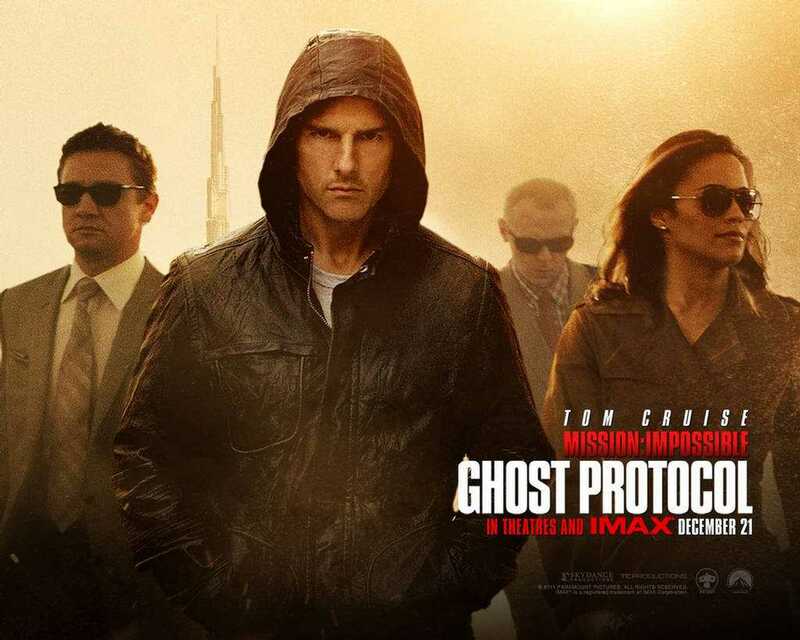 Ghost Protocol is meant to be a straight up spy-action movie and it delivers very well in that department. From the opening scenes of the movie as we get introduced to an undercover Ethan Hunt breaking out of a Russian jail to the various heists, from the car chases to Ethan hanging off the side of the Burj Khalifa in Dubai, this is a very enjoyable movie and I would recommend it purely on that. That is, if that was the only good thing about that film. All the main characters, Ethan Hunt, the members of his unofficial team and Anil Kapoor were fun to watch in all of their scenes. Nothing was forced and the actors played out their parts quite naturally in my opinion. Tom Cruise I would particularly mention here because having seen his last film, Knight and Day which was a terrible film, he has delivered a much better experience here. At times, you do feel that Ethan Hunt has bitten off more than he can chew and that things are pretty dire for his team. Thankfully, there are no weird deus ex machina moments to get the team out of trouble. 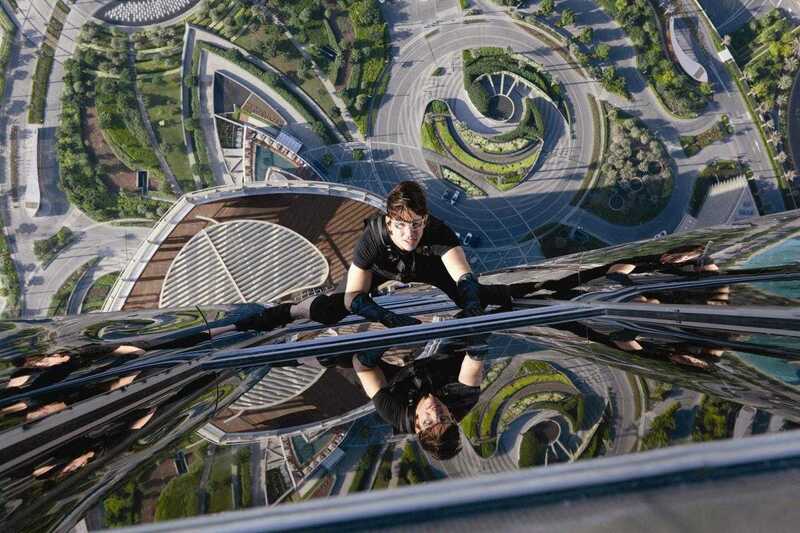 In a sense Ethan Hunt pulls himself and his team through the bad moments by utilizing all their skills. Paula Patton delivers a decent enough performance, and it could have certainly been better but that I think is more a function of the script and the direction rather than her own acting. From her fight sequences with Léa Seydoux’s Sabine Moreau to her seduction scenes with Anil Kapoor’s Brij Nath to her final scenes with the villain’s henchman whose name I can’t remember, she is quite fun to watch. She easily fits her role as Ethan Hunt’s unofficial second in the team and her camaraderie with them is never heavy-handed or forced. And that is something that goes for the entire team of IMF agents. Although the movie is geared to present Ethan Hunt as the top dog, the others also get ample screen time to show off just who and what they are and for the most part it all works well together. Simon Pegg as the typical genius-machine-wiz is delightful because of his near-impeccable comic timing. It definitely would have been great to see more of him but still, Benji Dunn isn’t sold short either. That counts for something I suppose. With a cameo role as Hawkeye in Thor and reprising said role in full for the upcoming Avengers movie, Jeremy Renner’s character falls a little short but the performance is still on par with anyone else on team. There are overtones of something mysterious from the moment he is introduced and while the reveal is a rather soft and emotional one rather than something epic as I was expecting it to be, I still enjoyed that part. And to see that mystery get a resolution in the end of the movie was good to because it wasn’t left hanging out there and it meant that the mystery hadn’t been thrown in just for the hell of it. Anil Kapoor. Now that man is going strong. With a strong role in Slumdog Millionaire and a recurrent role in 24, that man is going places. He is one of Bollywood’s most successful actors and one of my favourites in fact, so his cameo was something I was looking forward to a great deal. His hilariously over the top Indian tycoon was extreme good fun to watch, given that it had overtones of some of the comical roles he has performed in the past for Indian films. That Anil Kapoor has been missing from mainstream movies for quite a while now so his “return” was much appreciated. The story is your typical things go bad, good guys called in, good guys get into a whole load of trouble, villain is about to win, good guys stop villain. It is mostly predictable but, you are still kept busy guessing what is going to happen next because its not a typically predictable movie in that almost any cliche movie is predictable. The locales of the Kremlin, Dubai, Mumbai, and later San Francisco all add to that effect and it is most welcome. Speaking of Dubai, I have a major problem with one particular sequence, and that’s the sandstorm sequence. That is pure fiction. I actually live in Dubai you see and I have never heard of a sandstorm that bad that it cut down visibility to zero in an area that is heavily construction-ized with skyscrapers all over and one of the busiest streets of Dubai. Period. Other than that though, the team’s antics at the Burj Khalifa are fun to watch. The overhead shot of the building is just pure breathtaking. There should have been a sequence with the musical fountains at the bottom of the tower, but sadly that would have meant night shots. And then Ethan Hunt’s stunts wouldn’t have been that awesome. Another thing, once the team is out of the Burj Khalifa, Ethan Hunt visits a certain docks and that scene was fun to watch too given that I actually pass through that place at least three or four times a week. It is kinda on the way to my workplace you see. Good times. By the time the movie gets to Mumbai, time is kind of running out, both on-screen and play-time so the plot totally skips showing the locales there which is a shame. Showing the team in some of the well-known tourist stops would have helped sell the fact that the shooting took place in Mumbai and not city XYZ. But then again, it is Anil Kapoor who steals the show there so I can’t really complain. However, the setting of the climax between Ethan Hunt and the villain is something I did not expect to see in Mumbai. Reminds me of I, Robot for obvious reasons, once you see that particular scene that is. And as for the villain. He has to be the most inconsequential villain in the history of cinema. He has zero presence in the plot. Everything he supposedly does, any villainous henchman could have done the same with zero difference on the plot or in terms of presence. What a wasted opportunity that was. He never felt threatening at all during the entire movie! Overall, I did really rather like the film. More so because it wasn’t a convoluted waste of great material but was a simple and direct action film that was made to entertain far more than it was made to rake in the cash. Although it did rake in quite a bit of cash, that is irrelevant. It is a fun movie. Posted on February 11, 2014, in Movie Reviews, Review Central and tagged Action, Anil Kapoor, Brad Bird, Dubai, Espionage, Ethan Hunt, Film, Film Review, Impossible Missions Force, J J Abrams, Jeremy Renner, Mission Impossible, Mission Impossible: Ghost Protocol, Movie, Movie Review, Movie Reviews, Paramount Pictures, Paula Patton, Review, Review Central, Simon Pegg, Spy, Tom Cruise. Bookmark the permalink. Leave a comment.